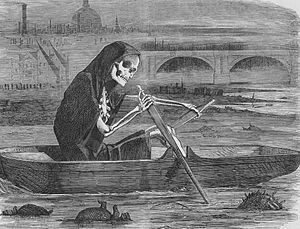 The Great Stink was in central London in July and August 1858. During hot weather the smell of untreated faeces was overpowering. It was caused by untreated human waste in the River Thames, and on its banks. An ageing and inadequate sewer system emptied directly into the Thames. The bad air was thought to transmit contagious diseases. There were three outbreaks of cholera before the Great Stink was blamed on the problems with the river. A proposal from the civil engineer Joseph Bazalgette for sewage treatment was finally accepted.